Austin provides self-catered traditional college accommodation for 288 students, a communal kitchen, and commercial cafe. Duval provides secure gated grounds, and is designed with small, familiar floors of up to eight people with shared kitchenette and bathroom. Set in spacious, leafy grounds, EPC’s friendly and dynamic community is a perfect home for your uni years. Located on the academic campus, MWC offers a range of facilities and accommodation types for students living on campus, or visiting for intensive schools. Furnished rooms for 205 residents, from both city and country locations across Australia. 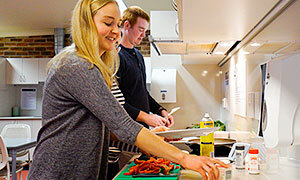 Independent living on-campus: self-catered options in private apartments or shared units. Direct contacts, important forms, and more details for students already living in college. What's so great about College life? Support and mentorship — our Residential System fosters a supportive environment to enhance your academic success and future employment. More choices — a variety of options for traditional catered accommodation, independent living, or a combination of both. "A college is so much more than just somewhere to sleep and eat. It is a comprehensive system of support that helps you transition from dependant learning (school) to independent learning (university)"
UNE's colleges now have more self-catered package options than ever with Wright College and Village and Austin College now fully self-catered. Mary White College provides both catered and self-catered rooms available. College living starting from just $150pw, including NBN, fully furnished room and heating.